Johnny Vic said, “You followed me alright. You followed me all the way back to 1621, Johanna!” The time-traveling treasure hunter had to convince his friend that they were about to meet the Pilgrims and witness the First Thanksgiving! And his trip back to 1927 in Vermont? It includes pirate’s treasure! Johnny Vic’s got girl trouble, times two, and he’s going to Plymouth, two times! Two different girls . . . two different Plymouths. 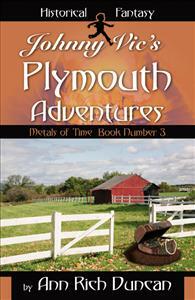 In Plymouth, Vermont he falls in love with Anna, learns about President Calvin Coolidge, finds hidden pirate’s treasure, and tangles with a stormy bad guy named Monsoon. And, Plymouth, Massachusetts? That’s where he and Johanna meet the Pilgrims and get a first-hand taste of the very first Thanksgiving!